I have posted multiple times chunky and layered necklaces and I think this one is one of my favourites. I love the mix of textures and colours. I would wear this with a simple on coloured outfit so that the necklace can standout because that's what it was meant to do. Very nice. And, yes, you definitely want it to be the center of attention. I'd love to wear something so stylish. Love chunky necklaces, too, and this one is wonderful! Gorgeous! 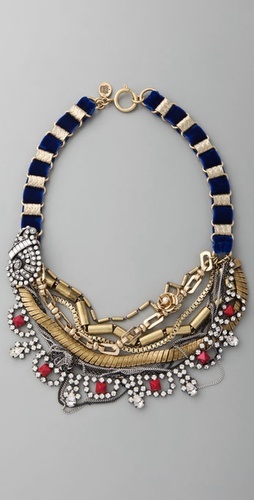 I love statement necklaces and this one looks perfect! I usually stay away from Juicy Couture jewelry (too many charms! ), but I love this! How gorgeous! You're right, the mix of textures and colors is divine! I love this statement necklace. Very interesting. I don't think I'd wear it, but it's definitely cute... reminds me of the nautical fashions of summer. Gorgeous!! Such a statement piece. BEAUTIFUL PIECE! I LOVE IT. BUT I DOUBT IF ID BBBBBBUY. ILL GO FOR THE CHEAPER ONE :) BUT ITS REALLY BEAUTIFUL. SO gorgeous! I'm usually not a fan of big statement necklaces but this is def an exception! 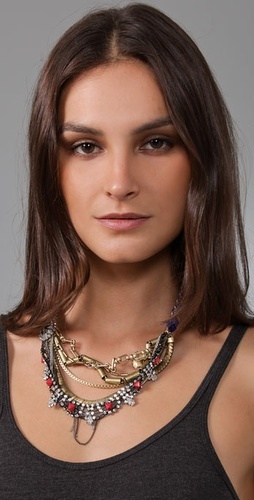 LOVE the necklace - but so expensive :( Gorgeous though! Juicy Couture is doing phenomenal things with their jewelry lately!